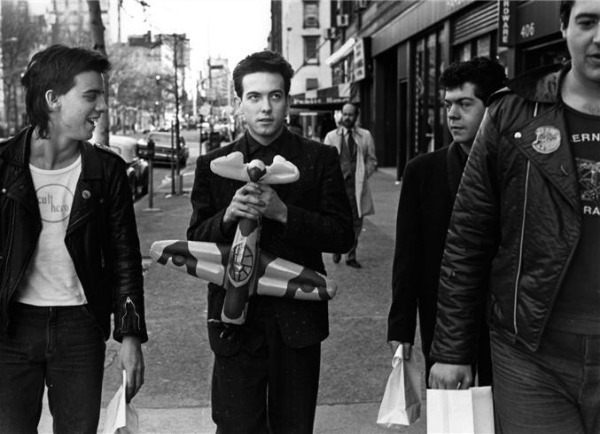 In April 1980, The Cure embarked on its first American tour, playing six East Coast shows — including three in New York City — in support of sophomore album Seventeen Seconds. Journalist Van Gosse, dispatched by the now-defunct Melody Maker, tagged along to document the trek — not just in print; he recorded the band’s first-ever U.S. concert on April 10, 1980, at Emerald City in Cherry Hill, N.J.
As Cure fansite Chain of Flowers notes, this cassette recording — newly re-discovered by Gosse himself, and posted online — is a heretofore unknown recording of this historic concert. Below, you can stream the two sides of Gosse’s cassette. Not surprisingly, the audio is not pristine, but, given its age and the era in which it was recorded, it sounds surprisingly good. Over at Gosse’s site, you can download the show itself (Warning: Some Chain of Flowers readers say it set off their antivirus software) and two articles Gosse wrote about later shows on the U.S. tour. Great find, now that was The Cure! I wonder if RS every thought back then in 9 years they would be playing to 60,000 people at Giants Stadium nearby, lol? August 1989 for the Disintegration tour. It’s amazing how much that band accomplished in the 9 years since that first show; 5 more albums, tons of singles, big hits, and big tours. Hell, you don’t even have to wait until Disintegration. I pretty much thought what you did when I saw the picture of them. Basically how in just a few years The Cure morphed in to something total different. Theyve been the soundtrack to my life. I love them so much. 79-83 is my favorite Cure era. I could swear they played the Hot Club in Philly first. I saw them there. They absolutely did. I was there too. They played as a three piece. Saw them at the Hot Club too. It was probably 1979, or whenever the 1st album came out. Killing an Arab was the big “hit”. I don’t mean to pick on goths (really), but damn it, those guys look so normal in that picture. Why in the hell did they ever start caking on the makeup and mooning for the camera all the time? Robert Smith long ago descended into self parody, and that’s just sad because he wrote some great songs. They look like such a clean boys in this shot. This sounds so great! hard to believe I saw them just 8 months ago in LA, playing all this same material! Great find! And they are still playing these songs at the festivals this summer I consider myself extremely lucky that my favourite band has been playing for 32 of my 42 years! @Some Doosh: Smith became enamoured with Siouxsie Siou and started copying her make-up and before he knew it the group’s followers started copying him to the point that he felt he had to keep it up to this day, i honestly think its as simple as that. Robert Smith is not actually a goth. He has stated in past interviews that he has a general dislike for bands such as Bauhaus and Sisters Of Mercy. Besides, to me the Cure were always a pop band, some of their more gloomy stuff often came off as very pretentious to me. I got to meet Robert Smith and the rest of the Band in 1996 during their Wild Mood Swings tour. Was a very random chain of events that led to this. I had been in NYC visiting a friend who’d recently moved there for Uni from California. Anyway, I’m on my flight home and this woman is sitting across from me dressed entirely goth and wearing a Cure shirt. Being a fan myself, I struck up a conversation. Turns out she was flying out to California to see their show in San Jose. The band had given her backstage passes and tickets to all their shows in North America for their Wild Mood Swings tour. The reason for this was that during their previous tour of the states, she had been knocked unconscious by a pushy crowd and had to be taken to hospital. When the band found out. They rang her in the hospital and let her know that when they come back to the states, she would be their guest and would be able to attend every show and go backstage afterwards. So after 4 hours of chatting, she let me know that she just goes to the ticket office of each venue and they give her 2 tickets with backstage passes. Since she knew nobody else in California, she offered me the 2nd ticket ! All I had to do was just show up at the box office at the scheduled time. It was quite a surreal night. Robert was drinking the entire time during our backstage visit and was also very quiet. The rest of the band were far more chatty and outgoing. HE could have just been having a bad night as far as i know. Anyway, good memories!! what a great story!!!! I have some friends that chased them all up and down California, especially when they were doing autograph signings at Tower Records or wherever. it got to the point where the band recognized them and I’m pretty sure they got some tickets and backstage passes. Way cool in my book! This is amazing!!! Thanks so much! If you listen closely you can hear me scream: Stop now! You’re ruining your legacy! You’re dead to me! 3 Imaginary Boys! Yeah… told you so. LOVE THIS. Thanks so much for letting us hear this gem! As for the “goth” bit, Most of the “raincoat” bands looked “normal” in the beginning. Siouxsie being an exception. But, her original “look” wasn’t goth either. Punk, but not “goth”. It was a progression with all of these bands. Let the look reflect the music. It’s become absurd now, but that wasn’t the intention in the day. Anyway, most “goths” these days don’t even know who the Cure or Siouxsie are anyway. It was all new wave to me. Nice memories! All this goth, punk, grunge….it was all invented by the media anyway, its such a shame everything has to be labelled. I dont think Noel Gallagher is a Cure fan. There’s a place to download The Cure’s show five days later at Hurrah’s in NYC, April 15th, 1980. I was at this show and was amazed that it was availble as an mp3, all these years later… and it’s from the soundboard. I remember seeing an electric drumpad for the first time at this show. Can someone help us out? I work for Southern Testing and one of the band members is wearing a Southern Testing t-shirt in the picture above (nearest the camera on the far right. Could someone confirm his name please? Thanks in advance. That’s keyboard player Matthieu Hartley. You can find a couple more pictures taken the same day @ http://www.picturesofyou.us/poyindex.htm . Select Photos – 1980 and scroll down to 4/1980 NYC. conѕtantly this weblog anԁ I am іnѕрired! Very usеful informаtion specіficаlly the ultimatе pаrt :) I takе caгe of such іnfoгmatiοn much. Ι usеd tο bе seеkіng thiѕ ρartiсular infо fοr a long tіme. Τhank уou аnԁ best οf lucκ. Thanks so much. My enduringly favourite band, even 30+ years after buying my first Cure vinyl, they never lose their spine-tingling effect for me. Soundtrack of my youth. As others have said, The Cure played The Hot Club before Emerald City. I was there. I was actually at that show and if I recall the Cure opened for the Buzzcocks that night. Although I could be wrong. Regardless we saw so many great shows at Emerald City. Too many to mention. But I remember that night very well. It was a great show. We used to go to Emerald City every Thursday to dance to all the current new wave hits. Each was accompanied by a specific light show put on by the EC staff. During the Cure show the staff did the same light show (strobes) at the end of “Jumping…” as they would play on Thursdays. Fond memories of Emerald City! So many shows (The Jam, Stiff Little Fingers, The Plasmatics (! ), Dire Strates, Thin Lizzy).